Customer lifetime value calculates the profit contribution of a customer over time, by essentially utilizing a financial formula. 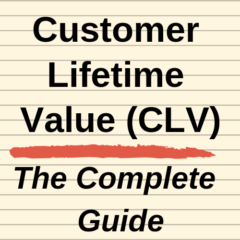 The accumulated value of all CLV’s (across customer segments) is equal to the firm’s customer equity. Therefore, it would be expected that there is a correlation between customer lifetime value, customer equity and brand equity. Consulting firms that calculate and publish brand equity valuations usually do so from the perspective of the “economic-use” of the brand. This means that they value the brand essentially on its financial contribution (that is, the additional profitability due to using/having the brand). Therefore, both customer lifetime value and most brand equity valuations are financially based. And as brand equity resides in the minds of consumers and the firm’s customers and the sum of all customers’ profit contributions will equal the overall gross profit of the firm – it stands to reason that the two elements are closely related. This is demonstrated in the following model below, which identifies that the sum of customer’s purchase actions essentially determine the customer lifetime value, which is a strong driver of overall profitability, which will also contribute to the brand equity valuation. It is important to note the customer lifetime value contributes to the behavioral aspects only of the brand equity valuation – not the emotional or attitudinal aspects, although the two obviously related in most cases.